Hello everyone! 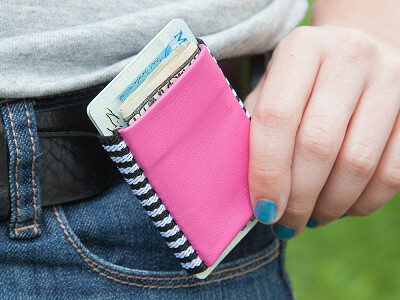 I'm proud to introduce TGT wallets to The Grommet. I'd be happy to answer any questions you have! If I carry just one or two credit caards, is the wallet still "tight" enough to hold them without their falling out? @Ginger Hey Ginger! Dan from The Grommet here. If you look at 1:18 in the video, you can see a shot comparing two TGT Wallets, one holding a single card and a single bill, the other holder 10 cards and 5 bills. Just a single card in a TGT wallet will keep it tight enough for your goods to stay securely in place. Hope that helps! Hi Mary Kaye, thanks for the question and right you are. It is meant for pocket carriage, but I don't know if it entirely rules out what you're looking for. 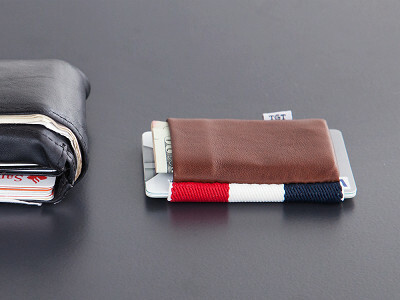 Change and a key or two could fit in the leather pouch and be held in place by the tension of other cards or cash. I am not sure if it will hold up to the rigors of dancing while being carried in a bra though. It might be worth a try, and in the case of a nickel slip, you can find all the details to our return policy here. Cool idea, have a suggestion, reduce the price to $16 and personally I'd like to see an end piece so things couldn't fall out the bottom. Hi D, thanks for the comment. The price is a reflection of US made manufacturing so while you may be paying a bit more, you're supporting American jobs in the process. 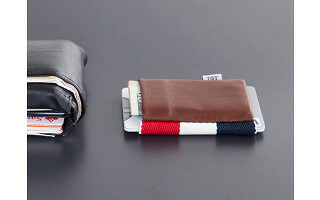 There is an end to the leather pouch so nothing falls out there and the band should be kept tight enough by your cards. Happy to hear it, Joelle, thanks for the support! Hi Marc, the woven design on the back is different. Nightcall 2.0 is entirely black, while Doctor has a tri-colored pattern. My question is if the elastic gets used to a thicker stack, then it thins down, wouldn't things fall out of the bottom due to it stretching? How long before the elastic loses the tight grip? Hi Linda, that's a great question. Because the width of the cards is the same, the tension should remain strong for a long time. Of course, longevity is one of the toughest aspects to test with any product. 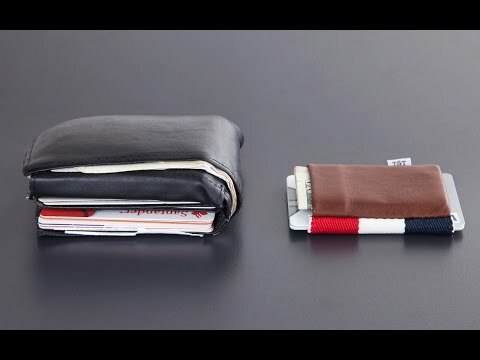 TGT wallets encourage slimming down on the amount you're carrying in your pockets so unless you are drastically changing the amount of cards you bring with you, you should get plenty of mileage out of it! Hi Jack- What about RFID? @Jim misfire. ;) These are often worn in the front pocket, so are not easily scanned. They don't have RFID protection cards that come included, but one can be bought separately for extra peace of mind. @Cornelia I bought some RFID card protectors and all they are is a tinfoil lined pouch so I would suggest lining any wallet with regular tinfoil where the cards are stored and save your money. I was scanned before I bought them and they tried to get $3000 in small purchases out of my account. Thanks to fraud protection they didn't get a dime. @Linda There are two pictures under the Americana of the elastic, and they are not the same colors....it looks like orange, white, and brown. He Teresa, the tri-colored elastic band is always red, white, and blue. The leather pouch is brown. The other picture you might be referencing is the casing the wallet comes in. The colors on that are slightly faded. How many credit cards and other cards (maximum) can I store in this wallet? @steve the wallet can store 25+ cards, but we recommend leaving some cards at home, keeping about 8-12 and "keeping it tight". Great concept and very cool looking. Do you have any that are vegan? They all looked like lambskin was the only option. @Bryan Hi Bryan, none of these wallets are vegan, but stay tuned because that may be a part of our future. @Jack Great! I'll keep my eye out! Cool idea, how many cards will it hold max? Hi Noby, Jack said above it can fit above 25 but 8-12 is recommended to keep things tight! Um, what advantage does this have over the simple broccoli rubber band? I am also troubled by its inability to hold change. Or should we all just toss that to the ground? Hi Susan, thanks for the question. For one, these look way better. I'm going with Nightcall 2.0 over broccoli band every time, but you can't go wrong here. The other advantage is also the answer to your troubles! The leather attached is a pocket that could be used for storing a small amount of change. Though TGT wallets are really at their best when you're not going into a situation requiring a lot of change. And just for the record, I'm not an advocate for tossing change to the ground. I'd look for a nearby wishing well or just hold on to it. You never know when a pair of nickels could save your life. Looks good but I would like to see one side stitched closed. I would think over time it would get loose & cards and cash may fall out. Hi Craig, thanks for the comment. 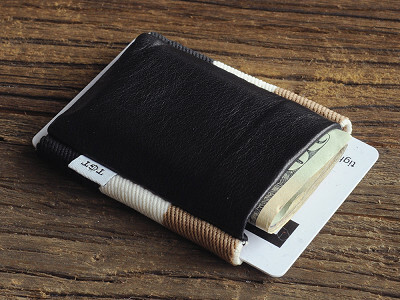 Cash can be stored in the leather pouch so you should have no trouble hanging onto it unless you're carrying wads of it. As for the wallet losing its strength holding cards, it's possible down the road it happens. Longevity is tough to predict with any product. But if you stay in the 8-12 card wheelhouse Jack mentioned, you will keep things tight for a long time.